Note Anytime has won multiple awards due to its innovative document editing environment. Usually, mashing up photos, handwriting and text together requires expensive layering environments like Photoshop in order to achieve high resolution documents and presentations. Note Anytime provides a virtual whiteboard with many features available for scaling, editing and compiling rich documents and presentations. Note Anytime’s Lasso tool can intelligently distinguish object layers, making it a breeze to edit richly layered documents. Users do not have to keep track of layers, the intelligence is already built into the Lasso tool. In response to customer requests for advanced editing options, MetaMoJi added an extra option to the Lasso selection tool, which highlights the object-oriented layering of the app. 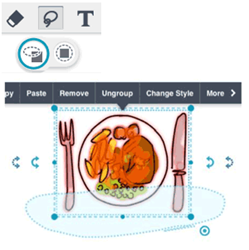 Note Anytime’s simple interface masks the true layering power for editing more complex documents which combine photos, handwriting, high resolution graphics and text boxes. The two options for lasso tool provide editing flexibility and time saving. The first of the lasso tools can intelligently distinguish between different elements within a composed document. A handwriting or typed text box is recognized as a layer just as photos and objects can be detected. Users can choose to either edit the entire composition as a whole with Lasso tool 1 or quickly and easily move around separate elements with Lasso 2. The first selection selects any content that is inside or intersects with the shape of a drawing on the screen. This is an easy way to select lots of different content all at the same time. Editing in Note Anytime is a breeze, without the complexity that usually comes from object oriented apps like Photoshop. Each element can be quickly grasped and expanded or enhanced by using the second lasso tool. With the new lasso tool you no longer have to worry about which layer your edits or photos may be on. Only content that is completely contained within the shape you draw is selected. When you have lots of layered content of different types, you can use the second Lasso tool to easily move and change specific elements of your document. The highly intelligent selection engine of Note Anytime knows that even a handwritten text box is another object layer. Any drawing or sketch the user makes in the document can be selected and easily altered with a few simple clicks. If user don’t like the color of the lines, they can change them quickly and easily. Another special tip is that users can press down on any blank space in a document and invoke the lasso tool even in pen and eraser modes.